Concentration mechanism is one of the homeostatic processes to maintain the body water balance. In our daily life, it is commonly experienced, that, whenever, there is dehydration arising from, excessive vomiting, diarrhea sweating, etc, the urine output is reduced and concentrated. Conversely, when there is excess fluid intake, there is a regulatory response from the kidneys by excreting a dilute urine called water diuresis. The hormone, which is taking part in the concentration of urine is ADH (vasopressin). Counter current multiplier system and counter current exchanger system. The loop of Henle of juxtamedullary nephrons are longer and extends deep into the inner medulla. The U shaped arrangement of the tubule, enables the fluid to flow in opposite directions (counter current) in the two limbs and during this flow, the ascending limb loses its tonicity to the descending limb. The descending limb fluid shows tonicity, which is identical to the tonicity present outside. The tonicity of the filtrate in both the descending limb and medullary interstitium is multiplied in a vertical direction. 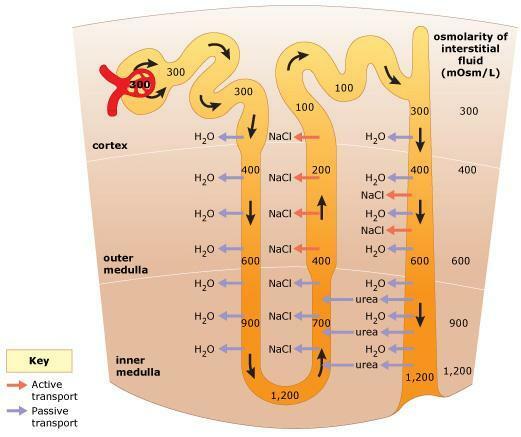 The tonicity begins at 300 milliosmole/liter of water (isotonic) at the corticomedullary junction and gradually increases to reach 1200 milliosmoles/iter of water (hypertonic) at the hairpin bend of loop of Henle. Since the ascending limb loses its tonicity due to the solute removal, there is a gradual decrease in the osmolarity of both the filtrate and the medullary interstitium. From 1200 milliosmole/liter of water, it decreases vertically upwards to reach 270 milliosmoles/liter of water (hypotonic). The filtrate that is entering the distal tubule is always hypotonic irrespective of the tonicity of the final urine that is excreted. The loop of Henle has a descending limb, where the cells are permeable to water and not to solutes. The ascending limb shows a thin and a longer thick segment. The thin segment of ascending limb shows movement of Na+ and Cl- along the concentration gradient from the lumen into the tubular cells and from the cells into the medullary interstitium, the Na+ moves by active transport. The thick segment is permeable to the solutes, sodium, chlorides, potassium and urea. These cells are not permeable to water. This part of the segment shows reabsorption of 1 Na+, 1 K+ and 2 Cl–. The reabsorption of 1 Na+1 K+ 2Cl- from the tubule of the thick segment into the tubular cells is by secondary active transport as it depends on the chemical gradient created by the active transport of Na+ from basolateral border of the tubular cell into the interstitium. The purpose of the thick segment of the ascending limb removing the solutes is to make the medullary interstitium hyperosmotic. More the hypertonicity of medulla, more the water can leave by the osmotic force from the descending limb. This will give greater solute load in the thick segment of ascending limb, which in turn ensures greater tonicity of the medullary compartment. Unless there is hypertonic medullary interstitial fluid, the collecting duct cells cannot have osmotic gradient for water reabsorption in the presence of ADH.